The helicopter which has most sparked the interest and imagination of visitors to the museum is undoubtedly the collapsible Rotorcycle. Small enough when folded to carry in a pod under an aircraft’s wing or on the luggage rack of your car, this contraption becomes a full sized helicopter in a matter of minutes – capable of taking off from your backyard and flying anywhere in the San Francisco Bay Area on a single tank of gas. 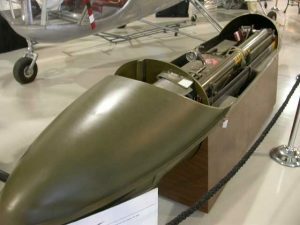 One of the initial design requirements was a device which could be dropped with a parachute to a downed pilot. Without any tools, the helicopter can be rapidly assembled, started, and can carry the pilot across enemy lines to safety. 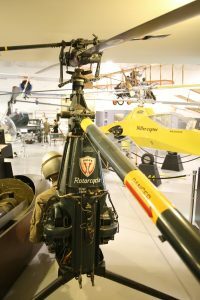 Originally designed by Hiller Helicopters in the mid-1950’s, the museum has the original ground-test prototype and a evaluation model on permanent display along with continuously playing footage of several early flights. 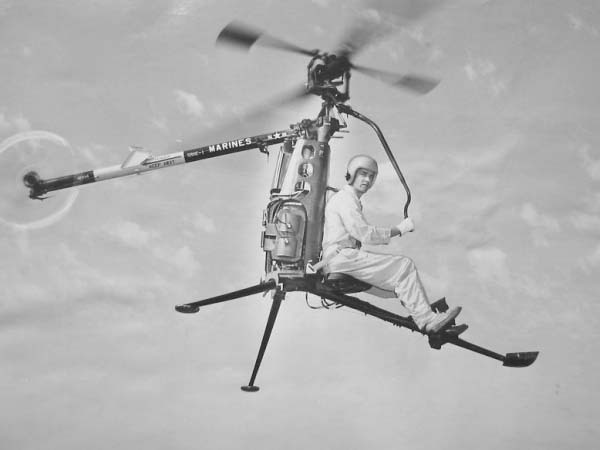 In 1954, Hiller Helicopters was selected by the Navy’s Bureau of Aeronautics to build a one man, foldable, self-rescue and observation helicopter. 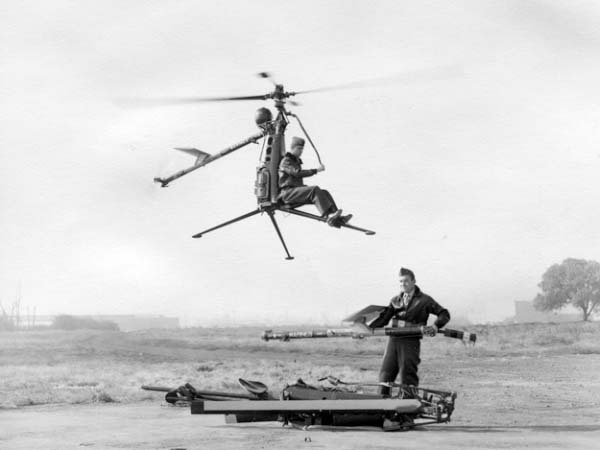 The Hiller Model 1033 was designated by the military as the XROE-1 “Rotorcycle.” Two prototypes were built at the Hiller Helicopter Plant in Palo Alto, California. The helicopter has the Hiller Rotormatic control paddles with a conventional tail rotor. Power was supplied from a Nelson H-59, two cycle, 40 hp, four cylinder opposed air cooled engine through a centrifugal clutch. The prototype Rotorcycle first flew on January 10, 1957. Saunders Roe, an English aircraft manufacturer, was contracted to build ten additional Rotorcycles. Twelve Rotorcycles were built in all. The English built helicopter first flew in October 1959, the first five were completed by the spring of 1960 with a second lot of five completed by December 1961. Five of the Saunders Roe helicopters were shipped back to the U.S. for military evaluation (with the designation “YROE-1”), the remaining five license built aircraft stayed in Europe at Helicop-Air of Paris, the European Hiller civilian sales agent. The Saunders Roe helicopters had a civilian designation of Model G-46. Seven of the Rotorcycles ended their careers in the United States; the two Hiller Helicopter prototype Rotocycles with the XROE-1 designation and the 5 Saunders Roe Rotocycles designated as YROE-1. BuAer 4021, 4020 and 4024 (note 1) were evaluated at NASA Ames Moffett Field, CA in November 1962. BuAer 4023 & 4024 were evaluated at Patuxent River, MD for the U.S. Marines Corps. The Rotorcycle never entered military service, as the requirements were cancelled before the military tests were completed. Of the 12 Rotorcycles produced, 5 are currently part of the collections of aviation museums and one is privately held (see catalog). One military version (YROE-1 #3) and five of the civilian model are currently unaccounted for. If you know of the location of any of these missing units, please contact Hiller Avialtion Museum.